After some serious apple picking, where we luckily also got some great bartlett pears, I updated an old recipe of my grandmothers for a tarte tatin (an upside down cake). The result was beautiful and delicious! Bake at 350 for 30 - 35 min. Cool for 10 min before inverting. 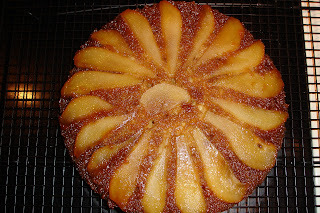 Below is the original recipe – I used ½ the brown sugar and about 2/3 the butter in the topping and it was much better. I made a double recipe and did one with pears, and one with apples. Yum! looks so super delicious! I am definitely going to have to make this! Yum.